Home > Clearance & Bargains > Clearance Shop All > 1 LOT AVAILABLE! 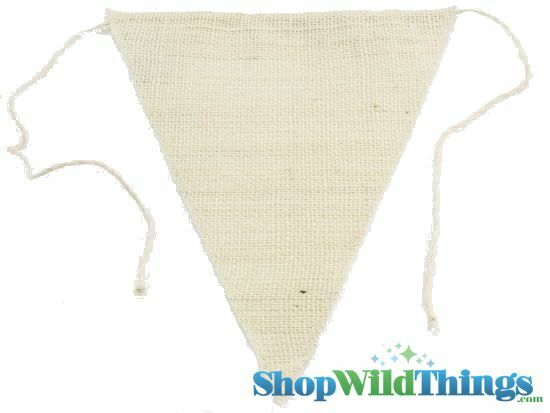 CLEARANCE Jute Triangle Banner 8x10" - Ivory - 226 Pcs! PRICED TO GO! There"s absolutely nothing wrong with these wonderful banners - we're just cleaning house and decided to bundle together all our remaining medium Ivory Jute Banners and further reduce our already low clearance price, which makes this a super deal! Each banner is 8" x 10" and you will receive approx. 226 banners. For parties, weddings, special occasions, school displays and art projects, these Jute Bunting and Pennant Banners are easy to use, fun to Decorate and they can be used over and over. We offer several colors of natural jute fabric triangles suitable for creating adorable hanging displays! Each triangle is sewn on the edges all the way around so that you will not have fraying fabric to contend with. 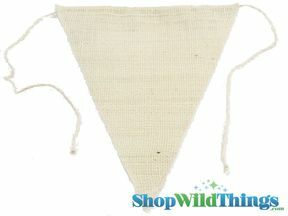 There is a nice pocket at the top of each triangle into which a matching jute string is inserted. Simply tie the strings end to end with other triangles to create your perfect look. Add some stencils to make banners such as those that read "Just Married" or "Congratulations"! These Ivory Triangles are also available in lots of sizes 6" x 8" and 9.5" x 12".